I’m tuning in to the show tonight and I hope you will be joining me. I will be looking to see if any of the contestants discover Frado and my secret weapon: The Arc Trainer. Behind the scenes last season, Frado and I spent upwards of four hours each day on the Arc. The viewer didn’t see it because a lot of that footage didn’t air, but it was definitely our ace, our secret weapon to conquer. When we arrived at the Ranch, I had never seen the Arc before. Frado and I started doing the pre-programmed interval routine on the Arc. I was blown away as we were burning upwards of 1,200 calories per hour. Amazing. Our Body Bugs were showing a lower number so I went to Bob and asked him if it was possible we were burning that many calories in such a short period of time. Bob said yes. He said given our weight and the level of output we were putting in, and given what he knew about the Arc Trainer’s ability to produce the most impactful workout you can get, the numbers shown on the machine were accurate. He also told us that because of the Arc’s smooth motion—which also reduces pounding and wear and tear on the body—the Body Bug couldn’t calculate calories for it as accurately as it can, for say, a run. 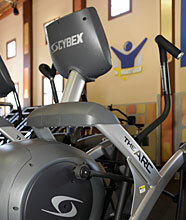 We started working out side-by-side for four hours a day on the Arc Trainer. We did hour-long intervals with ten-minute breaks between each set. We increased the resistance from level 20 in the first hour to 65-70 in the last hour. We literally stayed on it until our feet felt numb. The night before the final four, Frado and I were on the Arc at midnight. We knew we'd see the results on the scale at show time. And we did. I’m not at all surprised we finished first and second and Brendan won the home contest. Together, we knew early on we had the Arc on our side. As a contestant, you're constantly looking at your numbers trying to gauge how you're doing. My bet is that one or more of the Season 11 contestants have hit the Arc by now and are experiencing the phenomenal calorie burn it produces.